← Chocolate Audio announce Black Friday Sales Galore ! 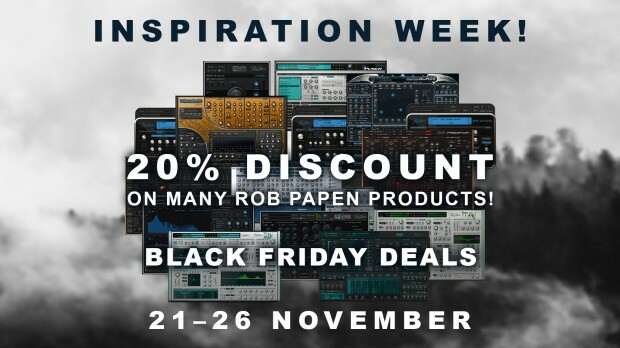 Rob Papen are knocking 20% off their prices for the Black Friday starting tomorrow the 21st of November and running until the 26th. Don’t miss out on these deals! Rob Papen Virtual Synthesizers and FX plugins are at the cutting edge of contemporary music production. They are Powerful instruments and FX that bring together innovative design, high end sound quality, and musical production-grade presets to help make your tracks shine. This entry was posted in DontCrack, Plug-ins, Promotions, Virtual Instruments and tagged Blade, Blue 2, EXplorer 5 Bundle, Go2 Software Synthesizer, MasterMagic, Predator 2, Punch BD, Raw, RAW-Kick, RG Rhythm Guitar Synth, Rob Papen, RP-Delay, RP-Distort, RP-EQ, RP-Verb and RP-Delay, SubBoomBass 2, Virtual Synthesizers. Bookmark the permalink.